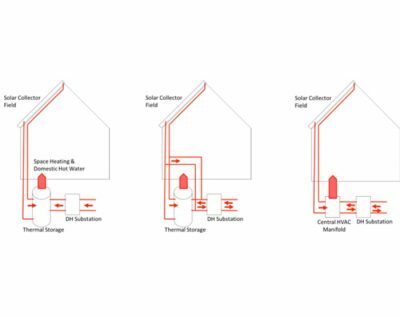 The connection of a solar thermal (ST) façade system to a district heating system allow for the direct use of ST heat in the building, while taking profit from the network for delivery/selling of excess heat and purchase of heat during periods of underproduction. The use of unglazed collectors for low-intrusive architectural interaction in façades is discussed. Studies are carried out on the heat production of the system and its capacity to cope with local demands. Economic studies are carried out in order to balance the investment and operational costs/profits of the system. In this paper, presented in the ICAE conference in Donostia-San Sebastian, the energy performance of a solar thermal (ST) façade system is studied in relation to its connection to a district heating system. Find more information in this paper (download at this link), or read the abstract below. Mikel Lumbreras and Koldobika Martin, Department of Thermal Engineering, University of the Basque Country (UPV/EHU). Roberto Garay, Sustainable Construction Division, Tecnalia. With limited access to fossil fuels, there is a need to reduce the consumption of these. In order to achieve that, renewable and innovative solutions are increasingly common in domestic energy supply. For this reason, solar thermal systems are increasingly used in buildings. Equally, District Heating systems are systems are identified as a key technology to de-carbonize heat supply in Europe. The aim of this study is to analyse the performance of an unglazed system integrated in an existing building. To ensure a wide market adoption of solar thermal systems, technologies should be compatible with the architectural design of the building. Thus, it is highly recommendable a discreet technology that enables designers to implement it without constraints, for example without aesthetical issues that limit the integration of solar thermal systems to roofs out of the sight of observers at street level. From all the thermal solar energy systems that actually exist, the unglazed collectors are the best choice for this application. Despite the fact that these collectors are quite simple, they are a suitable technology to reach low-to medium temperature levels required by modern heating systems such as Low Temperature District Heating (LTDH). The aim of this study is to analyse the performance of an unglazed system integrated in an existing building. In this case study, the energy performance of the installation is analysed, coupled with District Heating. Moreover, the economic comparison between some different ways of installation is shown.